the secret of youth may be as close as a nearby farm or supermarket. There is reason to believe that eating blueberries slows down the ageing process after elderly rats showed considerable improvement in age-related features in a joint study by Tufts University in Boston and the us departent of agriculture ( usda ). It is believed that antioxidants present in the blueberries protect the body against "oxidative stress", one of several biological processes that cause ageing. Barbara Shukitt-Hale of the Human Nutrition Research Center on Ageing at Tufts University in Boston and James Joseph of the usda report that while strawberry and spinach extract produced some improvement in memory, only blueberry extract had a significant effect on balance and coordination. Three groups of old rats were fed an eight-week diet supplemented with fruit or vegetable extracts with potential antioxidant effects. A fourth group of animals did not receive the special diet. The group of elderly rats fed the human equivalent of at least half a cup of blueberries a day improved in balance, coordination and short-term memory, which are key indicators of age-related decline ( Journal of Neuroscience , Vol 19, No 18). The rats used in this study were 19 months old -- biologically equivalent to 65-70 years in humans. They begin losing motor skills at 12 months. By 19 months, the time it takes a rat to walk a narrow rod before losing its balance drops from 13 seconds to five seconds. 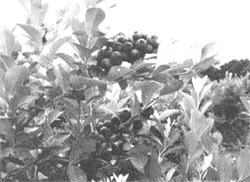 The animals that received supplements were given extracts of blueberry, strawberry or spinach. The rats fed on blueberry diets could stay on the rod for an average 11 seconds. They also performed better in negotiating mazes, as did those fed on strawberry and spinach extracts, which signals improved short-term memory. But the subjects on the strawberry and spinach diet were no better at staying on the rod than rats that got no fruit extract. Scientists believe antioxidants improve cell membranes so that important nutrients and chemicals can flow through better. In addition, the brains of all the rats receiving supplements showed signs of the presence of vitamin E, a key antioxidant. A cup of blueberries is a normal serving. The investigators were able to produce a noticeable improvement within a relatively short period of time. A next important step in the research will be to see if the improvements are long-lasting. When a cell converts oxygen into energy, tiny molecules called free radicals are formed. When produced in normal amounts, free radicals work to rid the body of harmful toxins, thereby keeping it healthy. However, when produced in toxic amounts, free radicals damage the body's cellular machinery, resulting in cell death and tissue damage. This process is called oxidative stress. The exciting finding from this study is the potential reversal of some age-related impairments in both memory and motor coordination, especially with blueberry supplements, said Molly Wagster of the National Institute of Ageing ( nia ) at Bethesda's Neuroscience and Neuropsychology of Ageing Program. Marcelle Morrison-Bogorad, who directs the nia program, said it remains to be seen whether results found in this study also prove true for humans. The only way to determine whether particular food ingredients actually work to slow age-related cognitive decline in humans, as well, is to conduct controlled clinical trials, and the nia is supporting two such trials.